ALWAYS CHASING / BIG SKY CONVECTION BLOG: 2010 Storm Chase 42 Teaser - August 16th - Augnadofest! 2010 Storm Chase 42 Teaser - August 16th - Augnadofest! It was certainly a tornado festival here in Colorado today! All of them were related to a stationary boundary which sat across the eastern plains. The first few were non-supercellular and while the last two came from a weak supercell, it is the boundary interaction that likely caused tornadogenesis. Awww heck, how 'bout some pics? 1W Deer Trail. No visible surface circulation from our vantage, but Hambone has video of it. Note the tumbleweeds being lofted in the foreground. 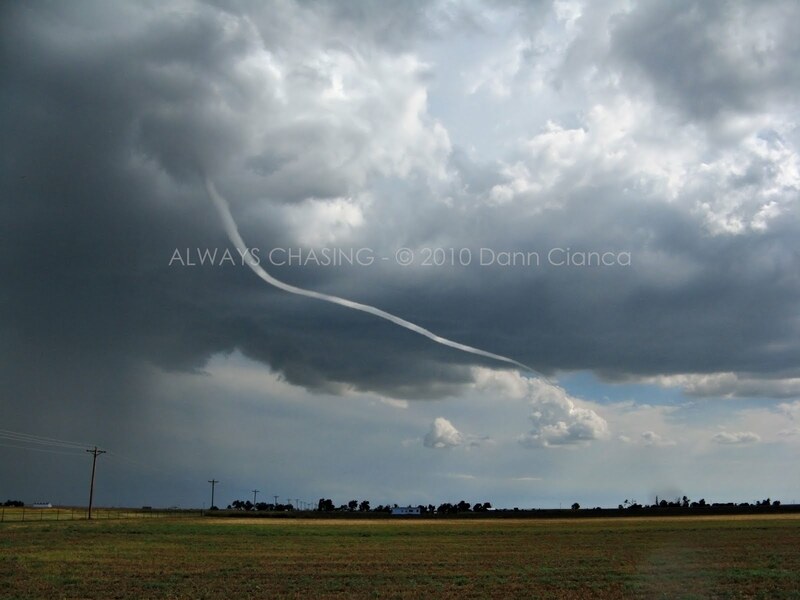 This was likely the beginning of subsequent funnels/NSTs in our area. Near Ninemile Corner in Morgan County. A second tornado in almost the exact same place, but our vantage changed. Again, near Ninemile Corner. Yeah, definitely a great day for everyone out chasing! 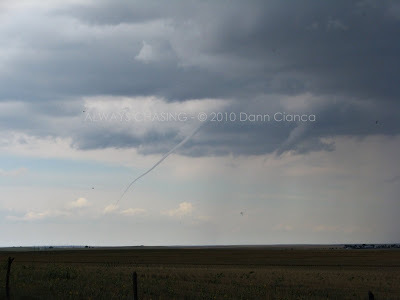 My favorite is the tornado near Agate and of course that is the one I was furthest away from. Not bad for the middle of August! 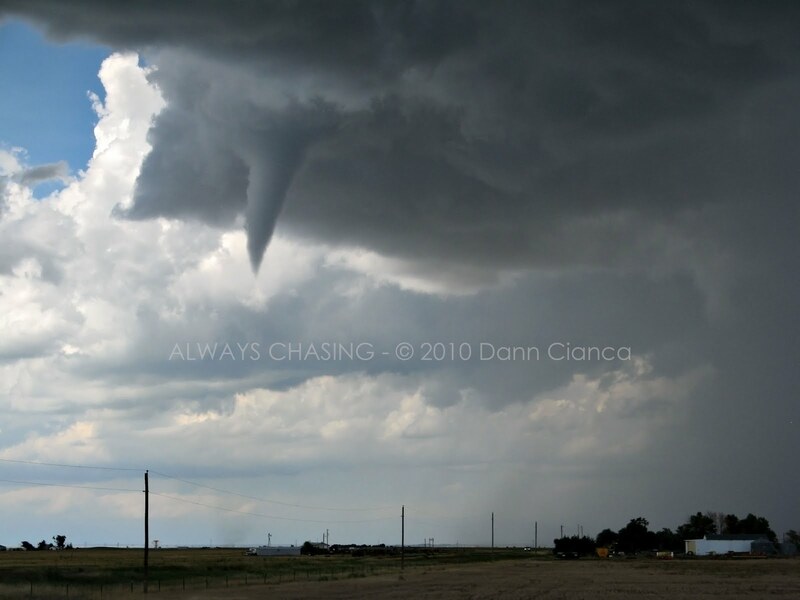 Saw the videos on TWC, you sir are King of the CO High Plains! excited and envious about your catches today....great to see you photos! I so need to step on that whole moving to Colorado thing. Excellent! Great photos and great catch! Always nice when that happens in your own backyard. That's about five years worth of tubes for us gopher chokers up here!! Wow were they ever pretty things too. Scott: Thanks! It was mine as well... the contrast with the rain in the background came out really well. August has been very good to me! 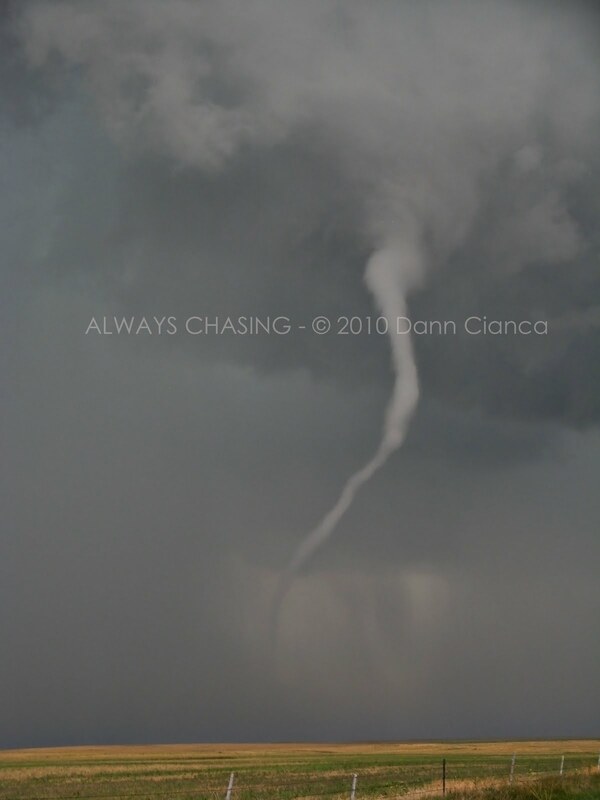 Saw my first tornado in August 2008. Paul! Thank you, sir, but I believe it was Tony and Eric's video on TWC. I do have great video of all four, though, but at the moment, can't really work with it. Skinner: Thanks! Can't wait to see yours too! Andrew: Thanks! Your lens would do magic here. Pat: Lol@ "gopher chokers" Thanks.